In my mailbox this morning was an article from the Sierra Club about strange flowers. Have you heard of the rafflesia arnoldu, the hydnora africana, mimosa pudica or the 10 foot amorphoshallus titanum? Being a botanical amatuer geek I found it quite fasinating to learn about these flowers we rarely see or hear of from far away. or nearby places. Traveling often allows one to experience the different flora and fawna but most of us do not have that kind of opportunity. We must rely on articles like this to educate and fascinate us in far away pleasures. Some, however, can be found in the United States at various Bontanical Gardens and are accessible to all. So, go out and find your own strange flowers. Visit the gardens around you or take a day trip to your nearest Botanical Garden. 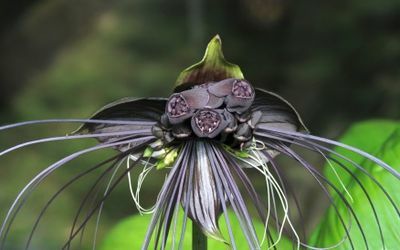 My personal favorite is the Black Bat Flower. It reminds me of a beautiful Easter Bonnet or a Hat worn at the Kentucky Derby. So enjoy the surprises in the article of far away or near bontanical favorites or strangest flowers.